On the 14th June 2017 life changed forever for the community and residents of North Kensington in the wake of the Grenfell Tower Fire. The total failure on the part of central and local government created a new paradigm in as much as that the people had to create spontaneously and intuitively their own support networks and aid agencies. The A40 Motorway (Flyover) which stands in the shadow of Grenfell Tower became a central place of community mobilisation. The 23 acres of land underneath the Motorway had been given to local residents as a form of reparations by TFL in 1971 because of the destruction caused by the construction of the motorway. But it has historically been a contentious issue in terms of community access to the land. For close to 50 years a battle has raged in the shadow of Grenfell and the 23 acres of land and “Don’t trust the trust” has been the legend relating to the legalised corruption that has taken place inside the charity tasked to manage the land. This corporate culture continues to plague the residents who live, breathe and work next to the motorway. Bay 56 in Acklam Village is the former site of Acklam Adventure Playground and Ebony Steel Band. Having deliberately been left in a state of arrested development for going on 30 years it has been a focus for community calls for reparatory justice in relation to land that was left to the community by Transport For London in 1971. On the 14th June 2017 , Bay 56 in Acklam Village was taken over by One Voice Community Collective and members of Westway23 in the wake of the Grenfell Tower Fire and repurposed as a donations, support and healing centre for the local community and survivors from the tower, walkways and areas surrounding. Thousands of people took part in the aid response that was conducted in Bay 56 but the Westway Trust conspired to obstruct and remove us from the space. The initiative then became an occupation and the Westway Trust representatives were shown that if they wanted the space back they would have to remove us physically as we had no intention of halting the works that were already in progress and vacating the premises. We are still currently occupying the space with no licence. This is a story about the disparity that exists between the rich and poor in North Kensington and the legalised corruption of charitable organisations who make profit from the theft and appropriation of community land, resources and culture. It is a story about the deliberate destruction and takeover of essential community resources by corporate entities, conducting land grabs on behalf of wealthy elites and oligarchs. 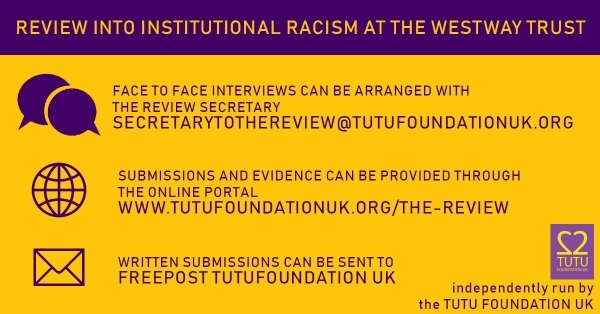 Why was former CEO Angela McConville allowed to resign with a full commendation and a £12,000 bonus whilst under internal investigation after employees, trustees and members of the local community exposed her gross nepotism and institutionally racist practices? 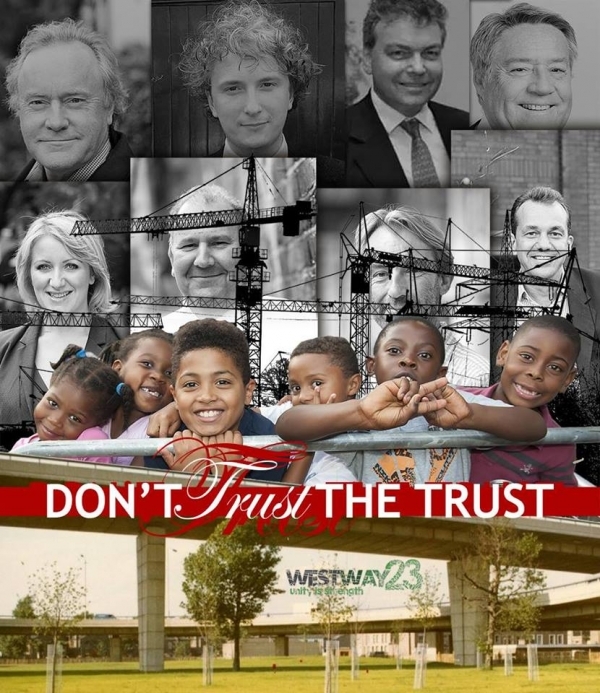 The Westway Trust is a hopelessly out of date and out of touch organisation that has historically instigated and aided the disenfranchisement and destruction of generations of local residents. Lost in old paradigms and institutionally racist practices they continue to deny access and self determination of the land by the community for the community. Instead they collude and make dodgy deals with their low friends in high places in order to fashion and position themselves as property developers. Senior staff and trustees have left the Trust in the last year because of these realities and there continues to be no real action taken internally to hold people accountable and resolve these issues. We invite you to join us at The V1llage this coming Friday 8th June to ensure that the corrupt practices of the Westway Trust are exposed once and for all. This will be the first of a series of press conferences and meetings that will name the names, present the facts and figures, and conclusively prove that in 2018 even after the Grenfell Tower Fire; the years the old saying remains the same, “Don’t Trust The Trust”.